Point is, what's the tip-off of showing an error if it works? I've reported this false error for you to fix it. 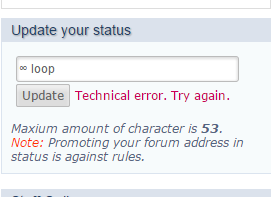 Because if a member of the forum updates it's status with unicode, and it says technical error, then checks it's profile if working, well it's working. And asking itself, why it is technical error, if it actually works. I don't think anyone here uses non-English characters and/or symbols for status, hence this is not a big deal on our side. Even if we want to fix it, we can't do it, because it's hosted on 3rd party server so we are just getting information from there.